[SPD450X] Our Outdoor Group Grills are adjustable 4-position fire grate and 2 hinged cooking grills. The cooking surface alone is 38 x 36 inch, which gives you 1368 sq. in. of grill area. Chains welded to each cooking grate limit their travel and enhance safety. All grates are made of 1/2 inch bars, welded on 1 inch centers and have heavy duty cool spring handles designed for public use. The fire grate has a formed lip to retain the burning coals. The entire fire box is made of 3/16 inch reinforced welded steel and is mounted on a 6 inch square pedestal with a 12 x 12 x 3/8 inch base mounting plate. Four 1/2 x 6 inch anchor bolts are furnished. A large ash lip helps prevent hot coals from falling out and also reinforces the fire box. A convenient 12 x 36 x 3/16 inch utility shelf is bolted on one side of the fire box. 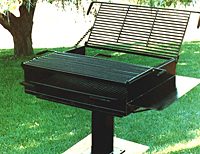 The overall size (including shelf) of this massive grill is 51 x 43 inch. Unit is completely finished in non-toxic heat and rust-resistant black enamel. For shipping quotes, orders or questions please call our customer service center at 1-877-483-9270.